Newbie Shooters! So Much Fun! One of the things I enjoy most about gun ownership is taking a “newbie” to the range for the first time. Sharing the experience is a big part of the fun for me. There are a LOT of misconceptions and mythology about guns. I particularly enjoy “de-mystifying” guns for those who have an open mind. My friend, Farokh, is one such person. He really was at square one, and realized that what he’s heard from others (who are phobic and misinformed) and the media just might not be true. Guns are inanimate objects just like our cars and even our handpieces. Our handpieces don’t start themselves up and autonomously prep teeth. We have to pick them up and use them for that purpose. Classroom materials! 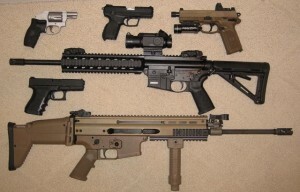 These are what I used to demonstrate and teach Gun Safety and Operation. It isn’t the handpiece. It’s the dentist that creates beautiful preps. Farokh is a world-class dentist, and his exceptional eye-hand coordination proved to serve him well as a shooter, too! Farokh was a truly blank slate. So, I wanted to spend some time going over Gun Safety and the operation of various types of guns, including pistols, revolvers, and rifles. A noisy gun range is not the right place to do it. So, we settled down in the consult room at his office for about an hour. After that, we were off to the range! And, like every other newbie I’ve taken shooting, he got a case of “perma-grin!” Look at that smile in the video. Happens EVERY time! Video after the jump! Farokh was a great “student.” He really was. No flinches. Steady as a rock! And, he put every round “center mass.” Mostly 10-ring and x-ring shots! Amazing. This entry was posted in Guns & Knives, Personal Security & Safety, What Happened Today and tagged first time shooter, Gun Safety, range time. Bookmark the permalink. 8 Responses to Newbie Shooters! So Much Fun! GREAT JOB Mike. 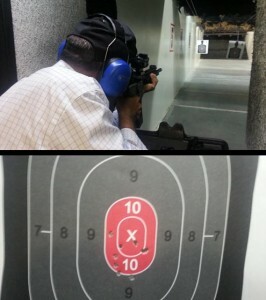 I took an endodontist that had never shoot before to the range. He had a great time. I always start them off with .22LR. Before she left she wanted to shoot 9. She liked it and said she would come back. Good job Mike. Love the smile on his face. Do you know anyone in L.A would take me out to the range? Thanks, Allan! A LOT of dentists are shooters. Chances are you have many local dentist-friends who are shooters, and you just don’t know it. The trick is finding who they are. Not everyone talks about it. Alternatively, go to your local gun shop / range (if there are any in L.A.) and sign up to take a class. I recommend this highly to all new shooters and prospective new gun owners. Allen, I’d be happy to take you to the range.